In this episode, Nancy Payne, editor of Kayak: Canada’s History Magazine for Kids, speaks with Maureen Nevins, music archivist at Library and Archives Canada, about a song from a wildly popular musical comedy, and a beloved British tune performed by one of Canada’s most famous ensembles. Nancy Payne: Tell Me, Pretty Maiden is a song from the hugely-popular Edwardian musical comedy Florodora, which premiered in London in 1899. 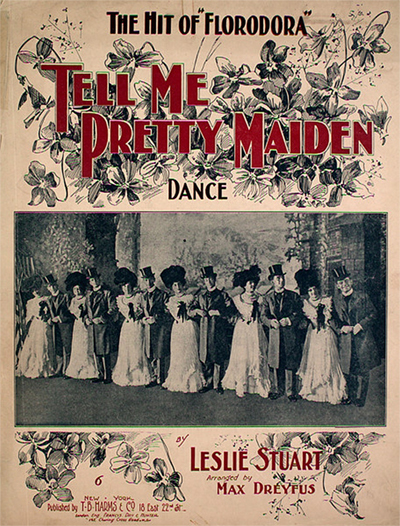 Owen Hall wrote the book, with lyrics by Ernest Boyd-Jones and Paul Rubens, and music by Leslie Stewart. By all accounts, this show tune is considered to be the most successful of its time. Can you first tell us a bit about Florodora? Maureen Nevins: Florodora tells the story of an attempt to cheat a beautiful young heiress out of her rights to a famous perfume. Owen Hall, who wrote Florodora, was an Irish-born theatre writer, racing correspondent, theatre critic, and solicitor. His real name was James Davis; Owen Hall was the principal pen name he used when writing for the stage. After successive careers in law and journalism, he wrote the librettos for a series of extraordinarily successful musical comedies in the 1890s and the first decade of the 1900s. The bulk of the lyrics in Florodora were written by Ernest Boyd-Jones, a young actor and author, however, Leslie Stewart wrote those for the more elaborate production numbers. Stuart began his career as a church organist before gradually moving on to write songs and incidental music for the theatre in 1895. It was not until 1899 with Florodora that he completed his first full musical-comedy score, which also became his first hit. The lyrics for Ada Reeve’s songs – Reeves would play the character Lady Holyrood – were written by Paul Rubens, who also composed the music for one of them. Though still in his early twenties and thus a dozen years or so younger than Stewart, Rubens was already making his mark as a musical comedy composer. Described by Owen as a “society piece”, the production of Florodora opened on November 11, 1899 at London’s Lyric Theatre and ran for 455 performances. Its New York premiere, with a somewhat revised book by Frank Pixley, opened at the Casino Theatre on November 12, 1900 and ran for 505 performances, longer than the London run, an unheard-of phenomenon. Nancy: What was responsible for the immense appeal of Tell Me, Pretty Maiden? Maureen: The success of Florodora is due in great part to the fame of a group of singers, actually, a double sextet of six men and six women who sang Tell Me, Pretty Maiden, the first major song hit from a show not performed by principal singers. Also known simply as the “Florodora sextet” it is an ensemble piece in which a little scene of courtship is enacted by six couples, all at once. With its upbeat and carefree rhythm, that sense of meandering aimlessly, and beautiful and unexpected transitions, it completely transcends the conventions of popular song. Maureen: Born as John Scantlebury MacDonald in Hamilton, Ontario, in 1871, Harry Macdonough (d. 1931) was one of the most prolific and popular tenors in the very early years of recorded music. He made cylinders before 1900 for the Michigan Electric Co. in Detroit – to be used in the company’s slot machine phonograph parlours – and for Edison. His surname was misspelled on his first cylinder label but he decided to leave it that way; he then deliberately changed the first name. By 1908 he had made some 350 records, and enjoyed success both as a soloist and in ensembles such as the Shubert Trio, the Edison Quartet (also known as the Haydn Quartet), the Orpheus Quartet, and the Lyric Quartet. He also sang duets with Grace Spencer and other star performers. Macdonough’s top sellers included Tell Me, Pretty Maiden with Grace Spencer. He became active in the business side of the recording industry while still performing but retired from singing in 1920. As for the American soprano Grace Spencer, who lived from 1872 to 1952, she is one of the earliest recording artists, and is known as the First Lady of the Phonograph. 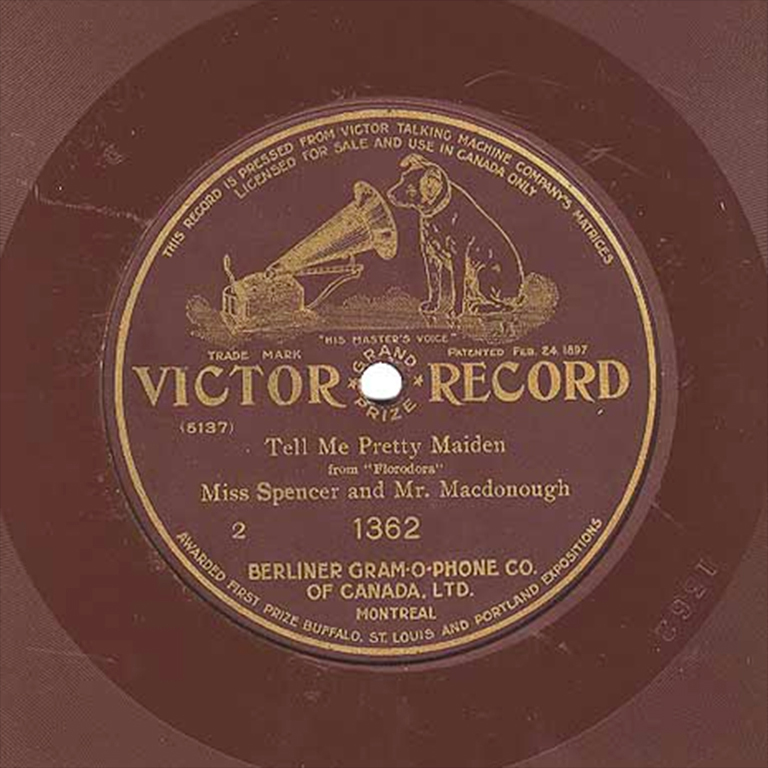 She recorded five duets with Harry Macdonough in 1900 on Edison brown-wax cylinders and they continued to record together for Victor in July 1901. Nancy: The lovely old English song Drink To Me Only With Thine Eyes is known and beloved far and wide, indeed it is possibly the most famous British song of all times. The recording in this presentation is, interestingly, an arrangement for string quartet. Perhaps we could begin with some information about the lyrics and the music. Maureen: Certainly! Drink To Me Only With Thine Eyes is a beautiful text by the great 17th-century English poet and playwright Ben Jonson, published in 1616 as part of the first collected edition of his works. The publication included a number of his plays as well a collection of poems titled The Forest. The poem Song: To Celia, more widely recognized by its first line “Drink to me only with thine eyes” figures among the fifteen poems that make up this collection. Ben Jonson, the son of a clergyman, was born in 1572 and died in 1637. He was educated at the prestigious Westminster School in London. He left the school in 1589, worked briefly as a bricklayer with his stepfather, and then entered the army, again briefly, before becoming an actor and playwright. It is worth mentioning that William Shakespeare held one of the lead roles in Jonson’s first great play, Every Man in His Humour, written in 1598. Ben Jonson is generally regarded as one of the most prominent playwrights and poets of the 17th century, and was England’s first Poet Laureate. The origins of the music to which Jonson’s text is set remain somewhat of a mystery. It is not known known whether a 17th century setting of the song exists, however, the beauty of the lyrics must certainly have appealed to the composers during that period. The earliest known setting is found in a folio manuscript book of airs dated 1752. Shortly thereafter, a Scottish composer, James Oswald (1710–69) titled his setting The Thirsty Lover and had it printed ca. 1753–54 for a secret composers’ society in London called “The Temple of Apollo”, of which he was a member. Thomas Linley’s (1733–95) setting was published with his posthumous, but likely dates between 1765–75. The settings I have mentioned are, however, quite different from the one that has become so familiar to us and which was first published ca. 1753–54 by S. Babb of London, as a Glee for three voices that quickly superseded Linley’s. Soon after, in 1778, it was issued by John Lee of Dublin as a vocal solo. It was also popular as a vocal duet between the years 1779 and 1784. The song must have become extremely popular since an American edition was published in 1789 by Alexander Reinagle (1756–1809) of Philadelphia. It is remarkable that neither Babb’s edition, nor Lee’s, nor Reinagle’s, nor any of the printed copies from 1775 –1800, give the name of a composer whatsoever. Although the melody’s composer has, at one point, been identified as Colonel R. Mellish, the theory is completely unfounded since Mellish was born in 1777, at which time the air had already been published. The fact that Mellish popularized the song by singing it at the concerts of the Noblemen’s and Gentlemen’s Catch Club, in 1798, may explain why it had been attributed to him. The song’s first documented author was one Dr. Henry Harrington of Bath, born in 1729. Although a physician, he also engaged with music, publishing numerous volumes of glees, catches, rounds a, and songs. He was the founder of Harmonic Society of Bath and a member of this same Society from 1784 until his death in 1816, and it is his name that appears as the famous song’s composer in a sheet song published by Goulding & Co. of London in 1803–4. Harrington is also credited as its composer in the volume A Select Collection of Songs, published by Hodgson of Newcastle-on-Tyne in 1806. Nancy: This is all very fascinating. Who is behind the melody’s arrangement for string quartet? Maureen: The arrangement is by the Swiss violinist Alfred Pochon, who lived from 1878 to 1959. 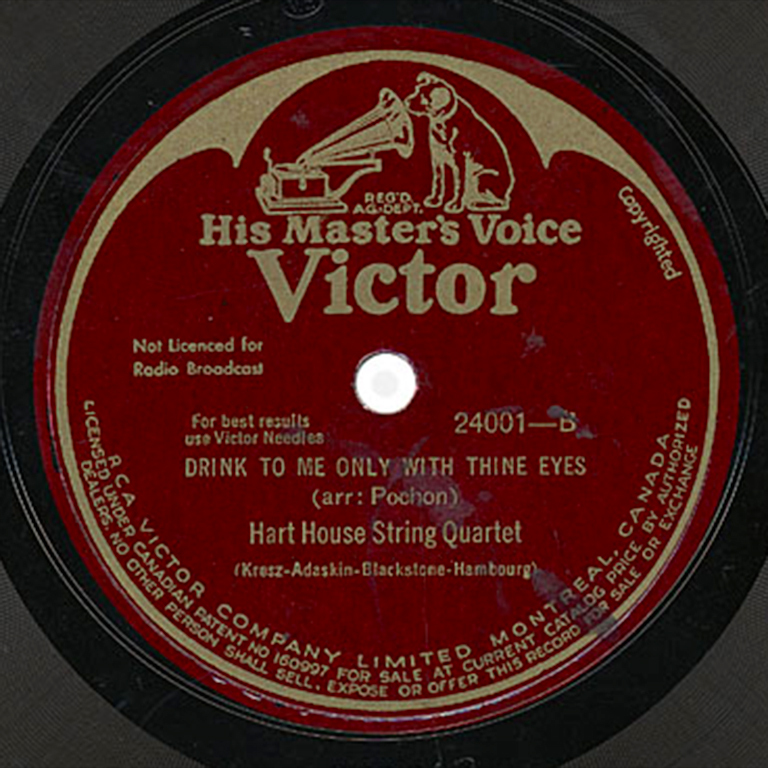 Pochon played second violin in the Flonzaley Quartet, which first recorded his arrangement of Drink to me only with thine eyes in 1920 for the Victor Talking Machine Company, on 78 rpm disc. Pochon, in fact, was the quartet’s founder and remained until 1929, when the ensemble disbanded. The Flonzaley Quartet was perhaps the earliest leading American string quartet, one of the first quartets to be recorded and whose recordings were actually issued under their own name. It is also one of the last ensembles to be sponsored by a patron of music, the Swiss-American banker Edouard de Coppet (1855 –1916), a friend of Alfred Pochon. The quartet gave some 2,500 performance throughout the United States and another 500 in Europe, and Pochon became particularly well-known for the “Flonzaley” encores, a group of pieces he either composed or arranged from popular tunes to be performed at the end of their concerts. His arrangement of Drink to me only with thine eyes is an exquisite example of what “popular classical music” could be in the early 20th-century. Nancy: Can you tell us about the recording you have selected for us to hear? Maureen: The recording is by the Hart House String Quartet, an ensemble which bears similarities to the Flonzaley String Quartet. Not only was the Hart House String Quartet the most famous ensemble in Canada during the first half of the 20th century, but it also was the first to be fully subsidized, in this case by the Massey Foundation. The members of the Flonzaley Quartet were from Switzerland, Belgium, and France and like them, not one of the original members of the Hart House String Quartet was Canadian-born. Here are Geza de Kresz on 1st violin, Harry Adaskin on 2nd violin, Milton Blackstone on viola, and Boris Hambourg on cello, performing an instrumental version of Drink To Me Only With Thine Eyes, recorded in 1926. The piece is found on side B of the quartet’s first record. Music: Tell Me, Pretty Maiden by E. Boyd-Jones and Paul Rubens (lyrics) and Leslie Stuart (music), performed by Harry Macdonough and Grace Spencer. Recorded 1904, Camden, NJ, Victor Talking Machine. Music: Drink To Me Only With Thine Eyes by Ben Jonson and Alfred Pochon, performed by the Hart House String Quartet. Recorded 1926, RCA Victor Company Limited. Released May 1932.